This is it! Finally I’ve successfully passed OCM exam. It was almost more than 1 year that I’ve been preparing for this. It’s almost impossible to find additional information about the exam online, so I decided to make my own preparation plan as I’ve done it for OCP exams before. And I would like to share my preparation tips with you and hope it will motivate you to start thinking about OCM. 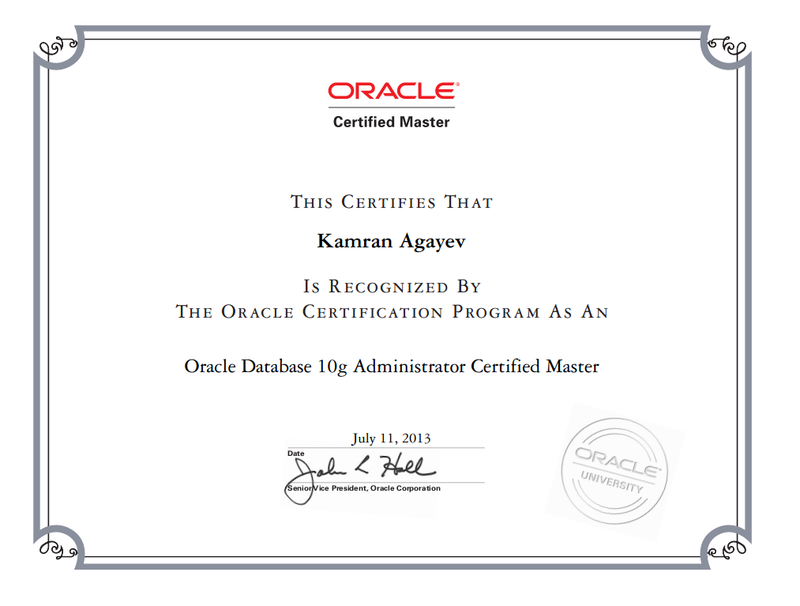 Please note that this document has already been checked and approved by Oracle Certification Team. – For each section and topic I went through the documentation, checked blog posts, studied metalink notes and created my own practices. I installed VirtualBox on my laptop and used it for all type of practices including RAC and Data Guard. I created different practices for each topic of each session, assigned a time frame for each practice and tried to solve them in a very limited time. I tried to not use GUI in all kind of scenarios. 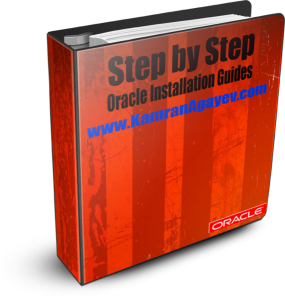 I was able to install Oracle Software and create a database both in silent mode using almost all parameters in a few minutes (with closed eyes ) . I learned all commands by heart; I was able to create a Data Guard using command line without looking to the documentation. I created RAC for several times, added and deleted nodes, went through all configuration and management issues. 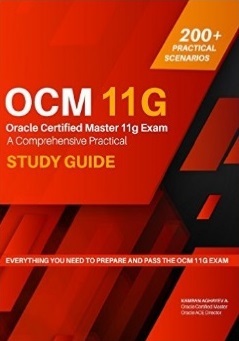 If you’re preparing for OCM exam, you have to forget GUI at all! – You have to be prepared for any type of corruption at any time during the exam. You have to test all kind of failure scenarios and recover from any type of error. If you are not able to recover your database during the exam, you will have to return home earlier. I created all kind of corruption and failure scenarios, and prepared and tested all “How to recover if …” cases. – I sensed that I would have to fight against the time during the exam, so I decided to improve my typing speed. For the last 7 years I’ve been typing without looking at the keyboard, but it wasn’t enough for me. I decided to improve my typing speed and accuracy, thus registered at www.typeracer.com and competed every day. As a result my typing accuracy improved further. 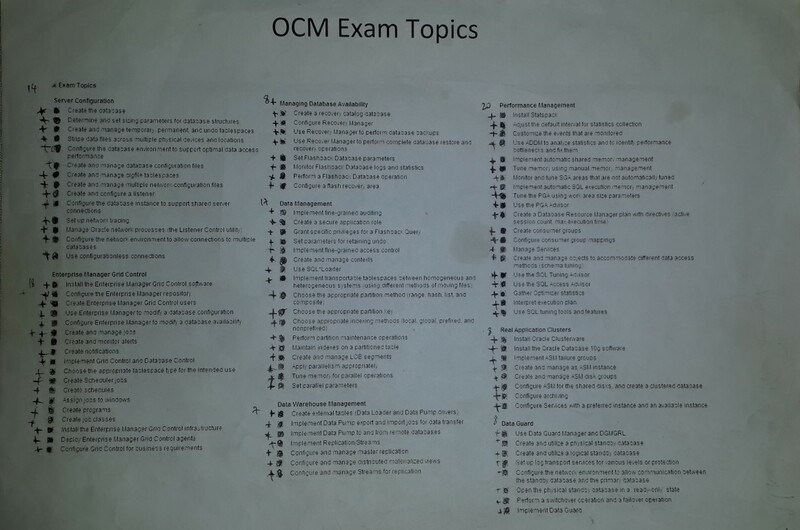 – After 8 months I finished my research almost for every section and topic of an OCM exam. For the 3 weeks of the last month I performed all practices that I had made for myself (all practices per week!). For the last week I did all practices per DAY! Every time it took me a few hours to finish all tasks. In the last week I realized that my fingers type faster than my brain process It was very hard to devote some hours per day for all practices, so I was preparing over the lunch breaks, after work, and mostly on weekends. Finally, registration day arrived. Actually, I had planned that date before the preparation and started the registration 2 months before the exam. When you register for the exam try to check the nearest country, book the nearest hotel to the exam center, get a document to have a VISA from the embassy and book flight tickets. Don’t forget to contact OCM exam center 1-2 weeks before an exam to make sure that the exam will proceed and make sure you’ve received a confirmation letter from Oracle. Although I had not a chance to relax (slept only 3 hours before the exam), but I would strongly advise you to have a rest a day before the exam. You will not get any bug during the exam. The proctor is responsible for the discipline, provides information in the beginning of each section and doesn’t answer to any technical question. You can use nonsearchable documentation. As I’ve signed NDA, I can’t provide more information about the exam. In a nutshell, you’ll struggle against the time during the whole exam. I want to repeat again – If you come across a question that you haven’t prepared for and seen any time before, that can be a big problem. Theoretical knowledge is not enough; you have to have a practical experience. In order to avoid feeling nervous during the exam, you are supposed to have gone through the same experience during your DBA life. If you’ve faced such critical issues and solved them in time, then the exam will be less excited. 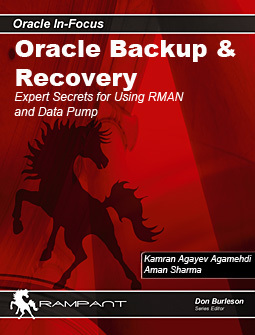 It doesn’t matter how experienced you are, it is still very challenging to use only command line interface to perform any requirement, to solve data corruption and recover the database from any data loss, create and manage RAC and Data Guard in a very limited timeline, tune the database and perform different kind of administrative tasks one by one without any mistake. 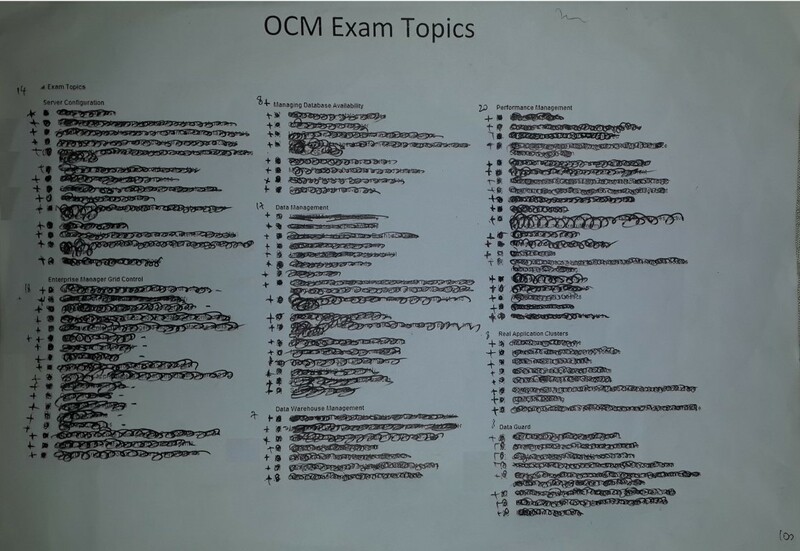 I hope my preparation method will help you start the preparation for the OCM exam. If you have any question, please do not hesitate to post your comment. Accept challenges in life, so that you may feel the exhilaration of victory. Unable to convert from “UTF-8” to “ISO8859-1” for NLS! After some minutes I was able to manage the database from OEM and the error disappeared.